Cult Beauty Global Beauty Goody Bag 2017: Rush To Get Yours! 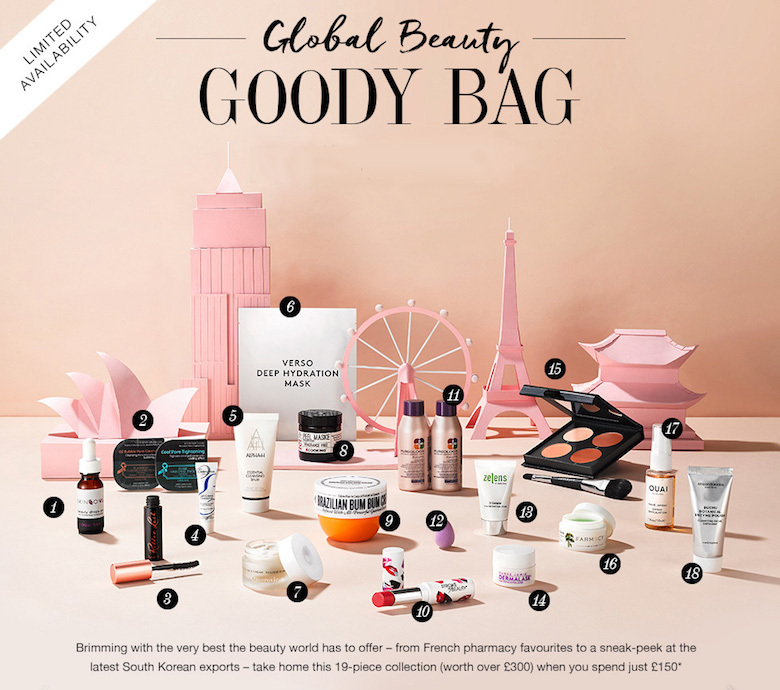 Cult Beauty's latest goody bag is here; this one is themed Global Beauty, and is free with purchase of products worth £150. The contents of the bag are worth more than £300, and include several recent launches, and full-sized products. The grand reveal is below. The Cult Beauty Global Beauty Goody Bag contains a total of 18 products, of which six are full-sized. The bag ships worldwide. I ordered mine; I picked a DNA Scar Renewal cream and a serum (timely, since I'm undergoing scar revision), and the Alpha-H Beauty Sleep Power Mist. Can't wait for it to arrive! THE CULT BEAUTY BEST OF 2017 GOODY BAG IS HERE - CLICK FOR DETAILS. I'm most excited about the CoverFX Contouring kit, and the new Alpha-H Cleansing Balm. Alpha-H has my favourite cleansing oil, and I want to know if the balm is as good. And, the Brazilian Bum Bum cream is now my number one body moisturiser, despite of the mild shimmer. Great to get more! To get yours, go right here. Just shop for £150, and the bag is automatically yours at checkout. If you are stuck for ideas on what to buy, here are a few suggestions. The Cult Beauty Global Beauty Goody Bag has limited availablility, and this time's product choices are a mix of skin must-haves, and exciting makeup to try out. Get yours before all the goody bags are gone!